The kinds of challenges faced by people with arthritis differ based on type of disease and level of joint damage, pain, and stiffness. Thoughtful planning is useful for everyone; however, as we age, convenience and ease of use become more and more valuable. Today, home design experts promote the concept of “universal design”, the practice of making a home as safe and accessible as possible for people who face challenges due to aging or disability. These principles can be useful for anyone who is designing or renovating a home, as they can increase home value and eliminate the need for costly retrofitting down the road. Outside your home, navigating the outside world can be a daily challenge for people with arthritis. Everything from driving a car to waiting in line at the post office can be affected by joint pain and stiffness. Here again, smart design and planning has helped with ease of mobility. When it comes to employment and the workplace, arthritis and related bone and joint diseases are the most common cause of work disability in Canada. Employers collaborating closely with their employees living with arthritis have access to many job accommodations and other solutions to help employees overcome challenges in the work environment. 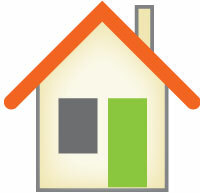 When searching for a new home or apartment, look for houses or apartments with frequently used rooms on the main floor. For example, having the master bedroom, kitchen, and living room on the main floor eliminates the need to climb stairs multiple times per day. As an alternative, eliminate stairs entirely with a one-floor house or apartment. The easiest bed to get out of in the morning is one that is fairly firm and raised off the floor by 18”- 21”. Consider buying an alarm clock that you can turn off by pressing a large button or tab, as opposed to one requiring squeezing or turning small buttons with the tip of your thumb and index finger. “Slip-on” slippers are much easier to put on than full shoe-style slippers. For women, a one-piece sports-style brassiere may be easier to put on and take off than one with the traditional hookand-eye closures. Consider changing cabinet door and drawer pulls to “cup” or “u-shaped” pulls. These allow the use of the whole hand to open drawers and cabinets, as opposed to small knobs that require grabbing with fingers. Alternatively, consider open shelving with no doors at all. Kitchen tools like knives and peelers should have large, softer handles to make them easier to hold. You can buy rubber grips that can be attached to the preexisting handles. Wall mounted low-flush style toilets can eliminate the need to get down on hands and knees to clean behind the toilet. As well, they can be mounted slightly higher than conventional toilets which can make it easier to sit down and get back up. Grab-bars beside the toilet and around the tub and shower can be very helpful. For people building a home or doing a renovation who don’t need them yet, walls can be reinforced beside the toilet to make bars easier to install if and when they become necessary. Lever style faucets for the sink, bath, and shower automatically mix both hot and cold water and eliminate the need for grabbing and twisting conventional taps. Installing a laundry chute is a great way to lessen the need to carry large, heavy laundry baskets up and down stairs in multi-storey houses. Sled-style chairs glide on wood floors or carpets and are easier to pull out and push in than four legged chairs. Higher, firmer sofas and chairs are easier to get on and off; ideal seat height is 16”-18” for sofas. Researchers at Arthritis Research Canada have shown that workers with arthritis, who have more flexible work arrangements and have received job accommodations, are more productive at work and less likely to become work disabled. In fact, in an Arthritis Consumer Experts survey, our members ranked flexible work arrangements as the most important strategy that was helpful for maintaining employment. While implementing changes in the work environment for employees living with arthritis, we must not overlook the real need for culture change in the workplace. The goal of creating more flexible and accommodating workplaces won’t be achieved unless we change how people think about arthritis and workplace accommodations. Employers and employees need to understand that for workers with arthritis, the struggle involves balancing their workplace responsibilities with the challenge of managing their disease including symptoms such as pain, fatigue, and stiffness, often with a gradual loss of physical function. Although it may be difficult to control some aspects of your work environment, ACE recommends below some strategies that can be used, and simple modifications that can be made to make working with arthritis easier. When seated at a desk, your legs should be at a 90-degree angle to your body, and your thighs should be parallel to the ground. If you frequently take calls from your phone, have a pair of headphones handy (ones that include a microphone). Using headphones to speak on the phone eliminates the need to hold the phone up to your ear. Alternatively, you can use a Bluetooth device, phone shoulder rest or speaker phone function to hold teleconferences. Try to get up every 15 minutes to move around and stretch. If possible, try to negotiate flexible work arrangements. The ability to work from home, work part-time, or modify a work schedule allows you to plan your work while considering the unpredictable nature of arthritis. Commuting long distances between work and home can be harder for people living with active disease. If you are looking to purchase a new home, try to find somewhere closer to work. A shorter commute means more energy for the rest of the day. As much as you are comfortable, educate your coworkers and employers. Many people do not understand what it means to have inflammatory arthritis. Fatigue can be misinterpreted as laziness; unpredictable flares may be seen as a lack of reliability and physical limitations can be ignored or resented by coworkers and employers. Only education can change these attitudes. It is entirely up to you whether you chose to disclose your disease, but open communications with your workplace may lead to less stress and anxiety about missing work due to active disease down the road. Learn about the Canada’s Best Work Places for Employees Living with Arthritis Program.